Young Neurosurgeons Committee: Is it Really a Training Ground for Future Leaders in Neurosurgery? Established in August 2005, NeurosurgeryPAC is organized neurosurgery’s voice in the political process. Its mission is to support candidates for federal office who support neurosurgeons and patients by making direct campaign contributions to candidates for the U.S. Congress who are supportive of the issues important to neurosurgery. NeurosurgeryPAC is nonpartisan and does not base its decisions on party affiliation, but instead focuses on the voting records and campaign pledges of the candidates. As an essential component to organized neurosurgery’s overall advocacy program, NeurosurgeryPAC has helped gain access to lawmakers on Capitol Hill to enhance the specialty’s sphere of influence on key health policy issues, including physician and hospital reimbursement; regulatory relief; health information technology; health care reform; medical liability reform; graduate medical education; and improving trauma and emergency care. For example, recently, the Medicare Access and CHIP Reauthorization Act of 2015 (MACRA, Public Law 114-10) was signed into law. This prevented a 21 percent physician pay cut, permanently repealed the flawed sustainable growth rate (SGR) and reversed the Centers for Medicare & Medicaid Services (CMS) decision to eliminate the 10-day and 90-day global surgery payments. Overall, this action has been estimated to have prevented $175 million in SGR-related cuts to neurosurgery in 2015 alone. When combined with the potential 25 percent global surgery payment cut, the impact of this decision translated into approximately $100,000 saved per neurosurgeon! Regarding graduate medical education, as the political voice of neurosurgery, NeurosurgeryPAC continues to underscore the importance of an appropriate supply of trained physicians to ensure quality healthcare services for all Americans. The current neurosurgical workforce has been estimated by the population ratio to be a single neurosurgeon per 100,000 people. While the actual workforce may vary by subspecialty and region, NeurosurgeryPAC is committed to increasing awareness among policymakers on physician shortages. Encouragingly, in the 115th Congress, policymakers introduced bills such as the Resident Physician Shortage Reduction Act (S. 1301/ H.R. 2267), which would help increase the number of Medicare-supported residency training positions. As highlighted above, NeurosurgeryPAC continues to focus on the advocacy issues most relevant to neurosurgery residents as well as recent graduates and their practices. As such, NeurosurgeryPAC is committed to engaging future generations of neurosurgeons in political advocacy. The First Annual Residency Program Competition was recently initiated. In this competition, recognition will be provided at the 2019 AANS Annual Scientific Meeting for neurosurgical residency programs with the highest participation rates and the greatest overall donation amounts to NeurosurgeryPAC. 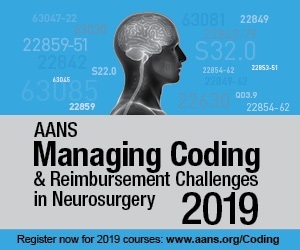 To participate in this program, neurosurgical residents should visit https://app.mobilecause.com/vf/AANSRES. Overall, through the generous support of AANS members, for the 2018 election cycle (covering calendar years 2017-2018), NeurosurgeryPAC was able to meet its fundraising goal of $500,000. This allowed the PAC to support 71 candidates, including 15 physicians (one of whom is a neurosurgeon). Many of these individuals helped organized neurosurgery make significant progress on its 2018 legislative agenda, including continue funding for the Children’s Health Insurance Program (CHIP) for ten years, abolishing the Independent Payment Advisory Board and moving the needle on medical liability reform. Strong participation by young neurosurgeons in 2019 will further help improve the health care system for our patients and our profession, and NeurosurgeryPAC invites young neurosurgeon members to join as contributors. The calendar year maximum for NeurosurgeryPAC donations is $5,000. Of note, donations to political action committees are not tax-deductible for federal and state tax purposes. More information about NeurosurgeryPAC, including candidates who have received contributions from the PAC and their positions on issues of importance to neurosurgery, visit https://www.aans.org/Advocacy/NeurosurgeryPAC. Additional questions regarding NeurosurgeryPAC should be directed to Adrienne Mortimer in the Washington Office at 202.446.2029 or via email at amortimer@neurosurgery.org.